Welcome to the Galaxial development log for November! This month has been spent focusing on the ship design interface, modules and under the hood features. Below is the new ship design and fitting window. Only a few available types of module are shown in the screenshot. There will be a lot to choose from upon release! Ship designs have a build cost and a maintenance cost for when they are active (the ship is not in reserves) Modules fitted to the ship affect these costs. Targeted modules are for things like weapon turrets, and come in 3 different sizes (small, medium and large). These can only be fitted if the ship has available targeted slots of the required size... you wont be able to put a small targeted module into a medium slot. Active modules are for modules like afterburners that need activating and cost energy to run. Passive modules are always active and constantly affect the properties of the ship. The ship role gives the design various bonuses. For example Scouts getting -50% Warp Time or Interceptors getting +20% Maximum Speed. Ship designs can be given any name or an auto generated one. 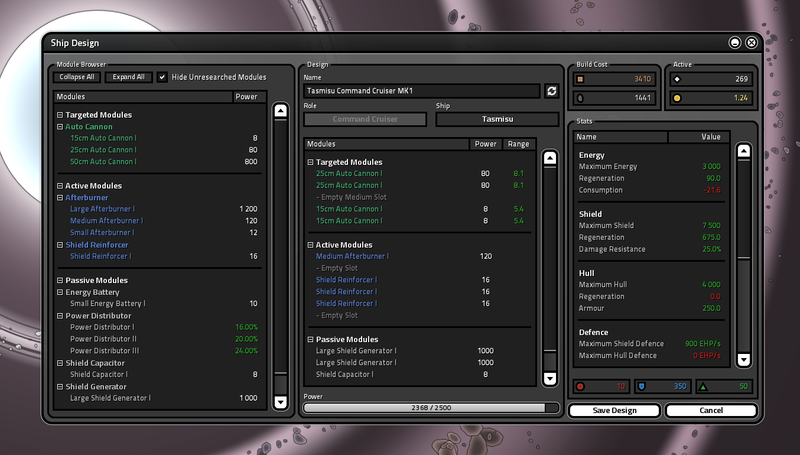 The 3 colored (firepower, defense and mobility) values in the bottom right are calculated from the ship stats to give the player a general score of how powerful the ship is. They are not used for combat calculations. For people that don't like to create their own ship designs, each race and faction will have its own default set of ready made designs tailored for its strengths. So the cannon is 25cm but shots laser,plasma,lead? TuriusRay wrote: So the cannon is 25cm but shots laser,plasma,lead? Autocannon's in the game will work like real life kinetic type weapons, like a repeating artillery cannon that shoots projectiles and costs no energy to fire... so lead or explosive shells would be the most fitting description out of those.